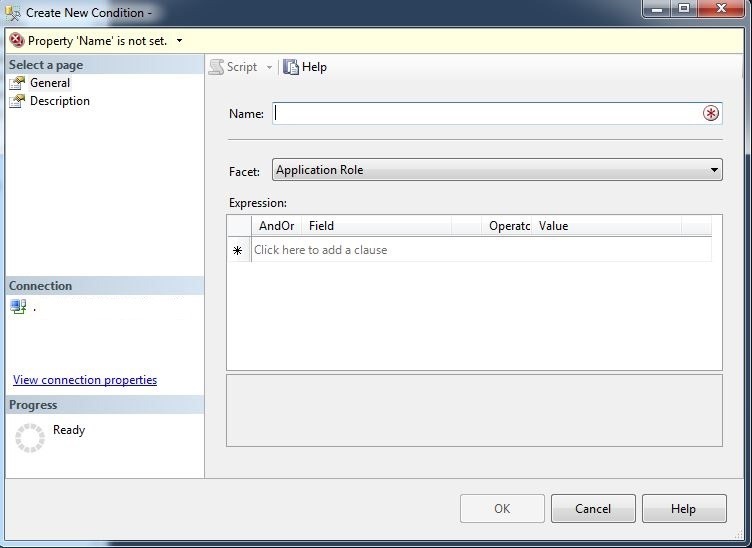 In the series of Learn SSIS step by step this is the 5th post. Now from this post we are going to use each transformation control one by one. So, lets start with simplest one transformation control which is “Sort”. Before going further let me tell you want we are going to do here. We will have a input result (which will be a text file) and then sort it and save in another file. Step 3:- Now once the file is configure. 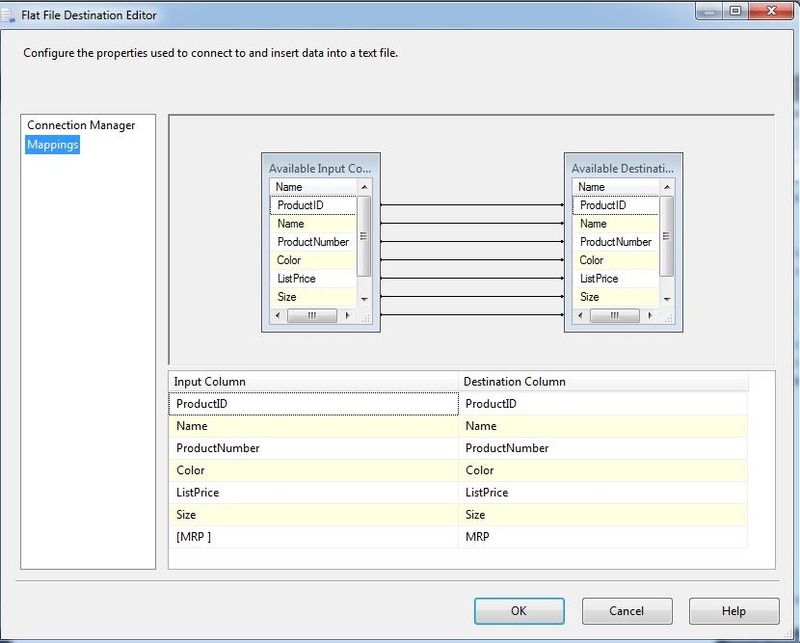 We have to drag drop SORT control from SSIS tool box as shown in below figure. I also added the output of flat file source to sort control. As shown in above figure. Now configure it. Click on Sort control and you will get following screen. 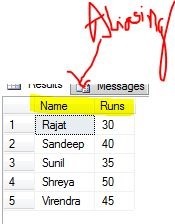 As show in below screen you can sort the data on any column and in any direction like Ascending or descending. 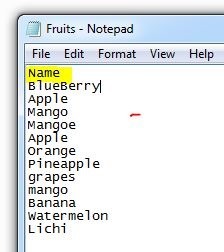 Right there is only one input column which is name so we are sorting name in Ascending order as shown below. Step 7: Now to cross check we will first see whether that file is created or not. If created then whether we have sorted data or not. So lets open the flat files. So, if you see at provided destination location a file is created and the data inside this file is sorted file. I hope you like this first transformation control. till then Enjoy!!! In last post #112 we understood WWH (What ,Why & How ) of SSIS. Now , lets move now real quick in practical session where we will try to create a basic simple package. 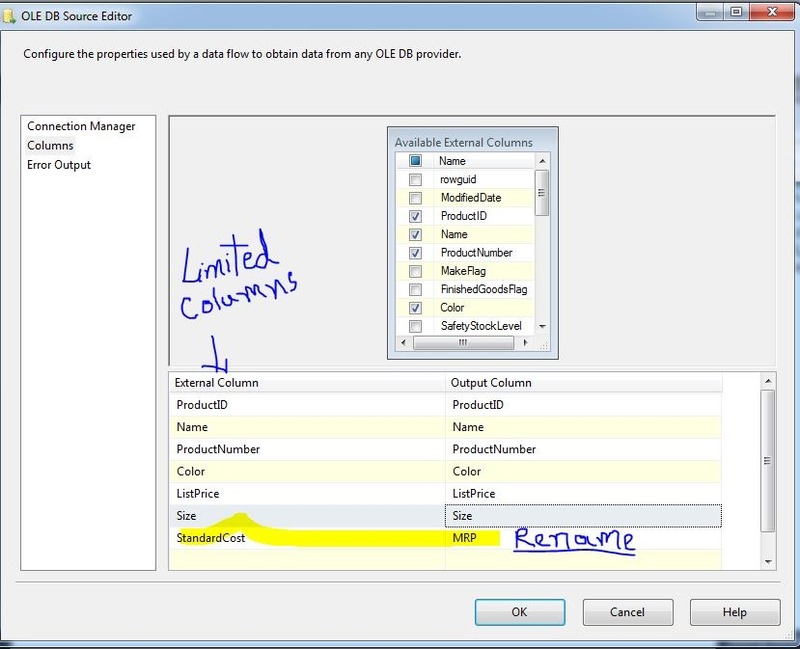 The example which we are creating is well known Export data from SQL SERVER to a flat file. 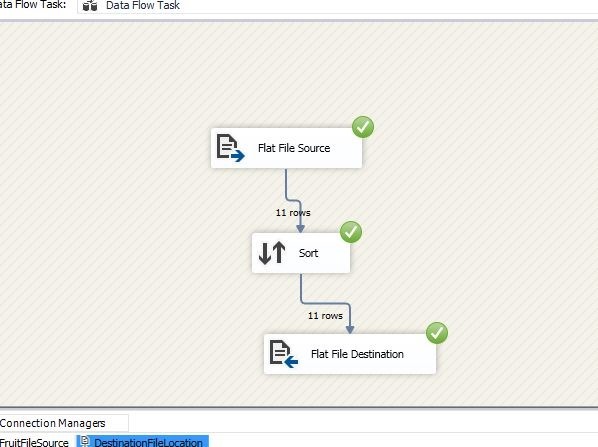 Step 3:- Now drag drop data flow task control from SSIS toolbox. You can give customize message by click control’s text. I prefer this habit so down the line if after few month or years if you need to do some maintenance or logic change you don’t need to think a lot for why this control is for. 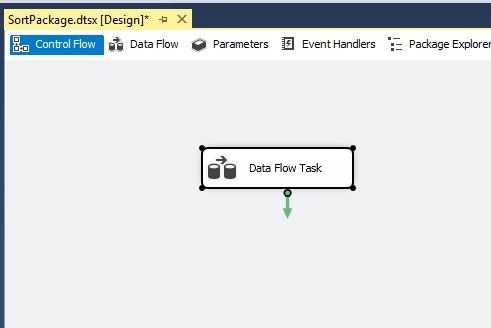 Step 4:- Now double click on Data flow control or click on data flow tab. Now on this area you have to drag drop source assistance. When you drag drop it you will get a pop as shown below. Like SQL SERVER, Excel, Flat file, Oracle. 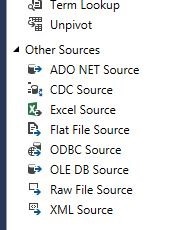 Although, you can select other sources also from SSIS toolbox as shown in below screen (As you are seeing there are various individual sources exists in toolbox itself so either use source assistance or drag drop individual source.It is worthless to explain here that excel source for excel file, flat file source for flat file and so on. 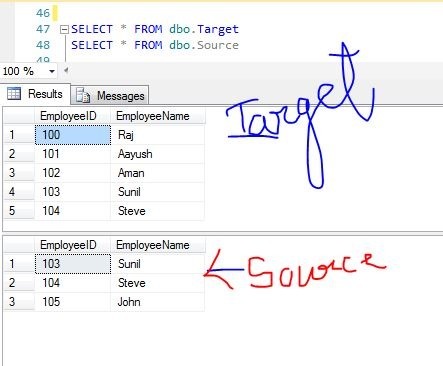 In this example we are selecting SQL SERVER. 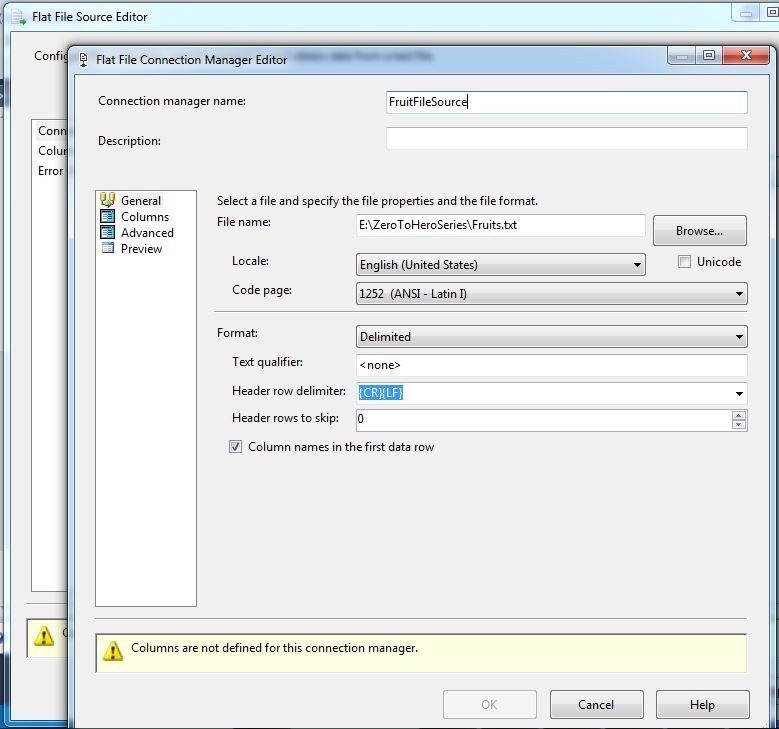 When you select Source Type then you have to configure connection Manager.For this we have to select “NEW” in connection manager panel and click OK button. 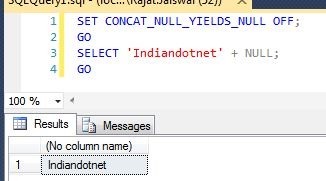 You will get below screen where you can give all the information related to SQL SERVER by which our package can connect with that data source. 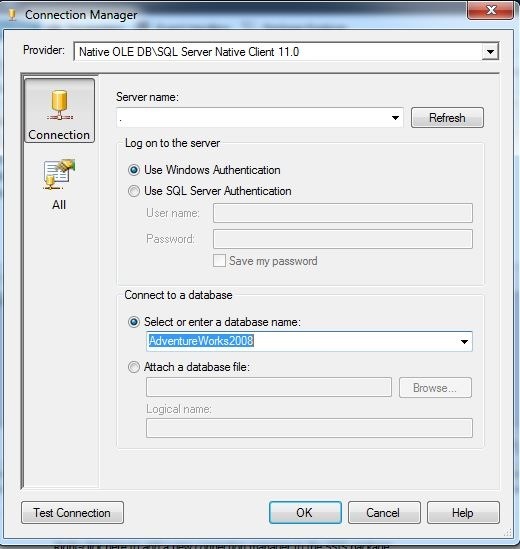 below I am using my SQL SERVER installed on my machine and using AdventureWorks database as shown in below image. Now once connection is setup. Now we have to export a particular table data in a flat file. but you are wondering which table or data which we are going to export. Step 5:- Now to select data which whether it is entire table, or stored procedure output , or view output or just simple SQL query. 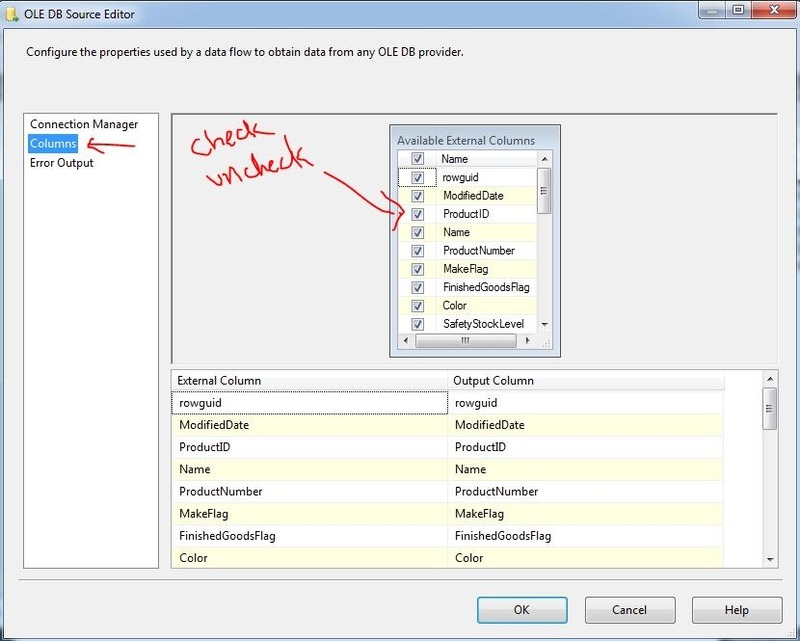 for this we need to double click on OLEDB data source and then we will get following screen. 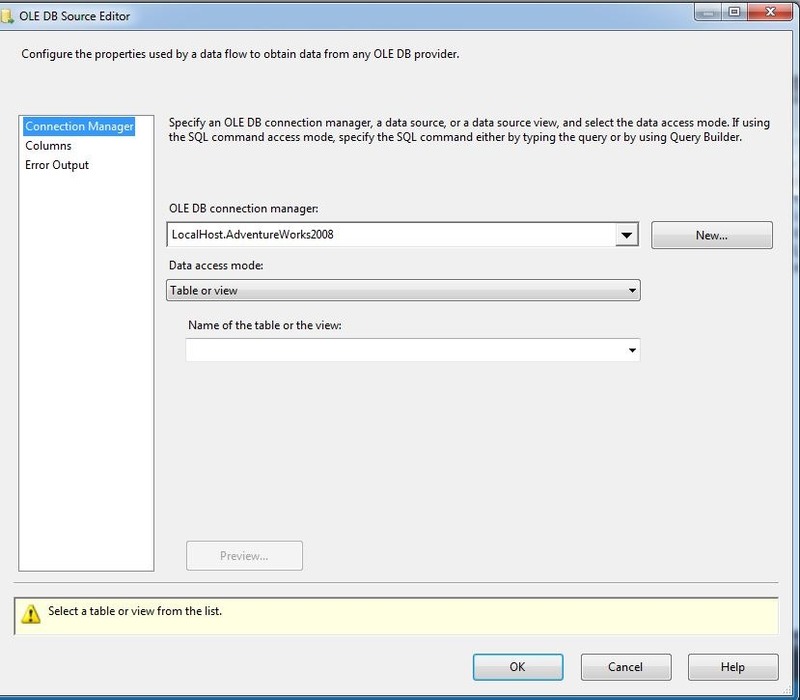 Now ,here we can choose data access mode either table or view, or SQL command ,SQL command with variable. To make this first example easy we are choosing table or view and selecting “Product table “ in below drop down for Name of the table or the view. 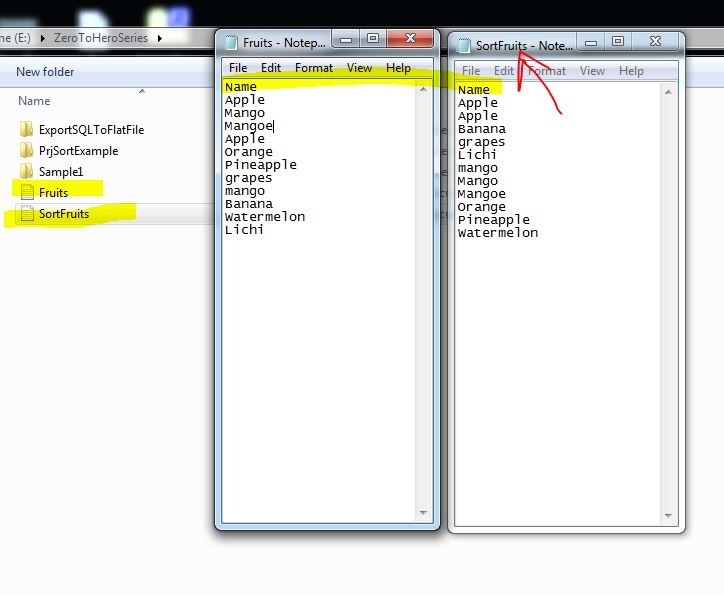 Step 6:- Now once you have selected table or view you can select specific columns which we need to export in flat file. For this we have to select columns option available on left side. when you click it you will get below screen. Here I am not explaining errorout option in detail in general sense just think it is configuration step if something failed. Now, we have source which we need to export in flat file, for this we may require a destination file in which we can store the data. So, Now we drag drop destination control which will be a flat file destination control as shown in below figure. 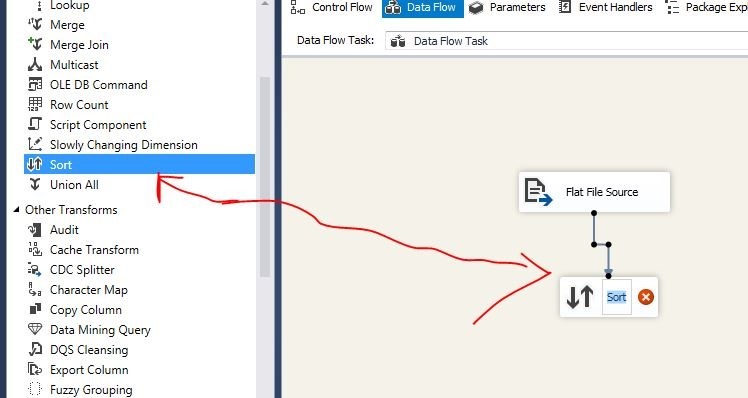 Step 9:- Now in above image you are seeing there are 2 arrows which is just flow direction means where the data needs to flow. 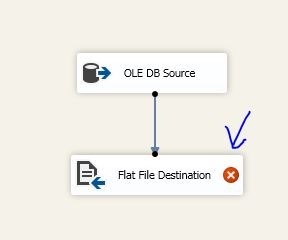 Obviously in our case the data needs to flow from oledb source to flat file destination. So what we need to do drag the blue arrow and release it on flat file destination as shown below. Step 10 :- I don’t know whether you noticed or not but let me tell you here. If you see above figure data is flowing from oledb source to flat file destination which is good but on same time there is cross image in red color which means there is some error in the control. So guess what is the error ? I think you picked right the destination is not configured. So to do this we need to double click the flat file destination. Step 11: When you double click you will get below screen. 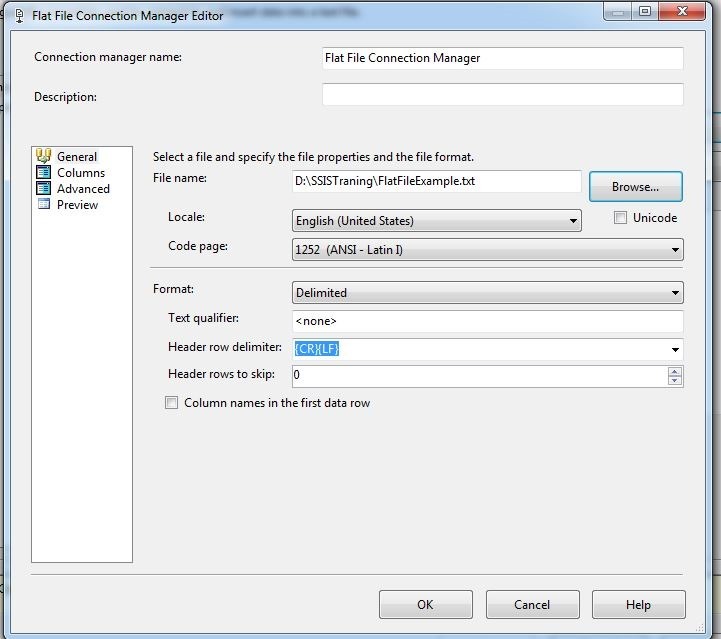 In which you need to configure the file location and file format like whether you want a delimiter file, fixed length file and many other option as shown in below figure. 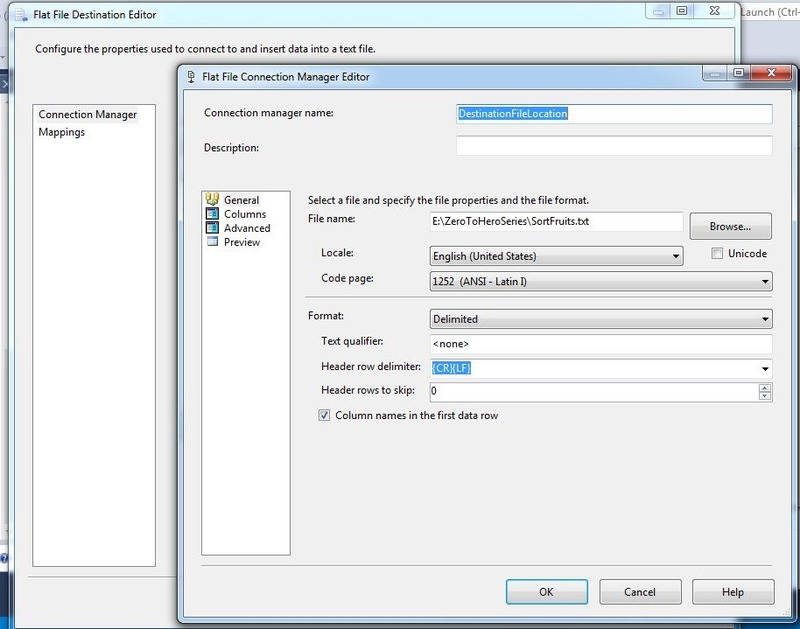 In our example we are using delimiter file option. 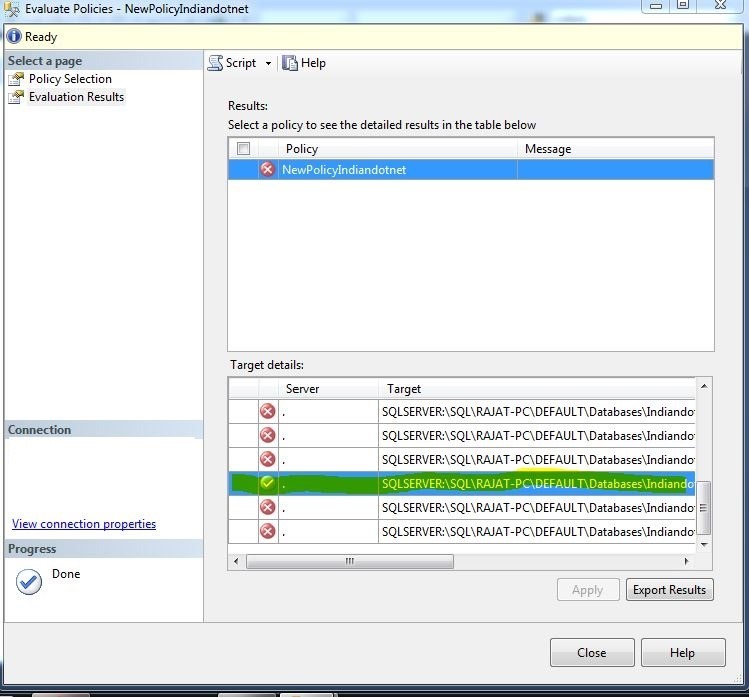 Step 12:- When you hit OK you will get following screen where you need to configure as shown in below figure. You need to give file location with file path. if you want different delimiter the you can choose that also. 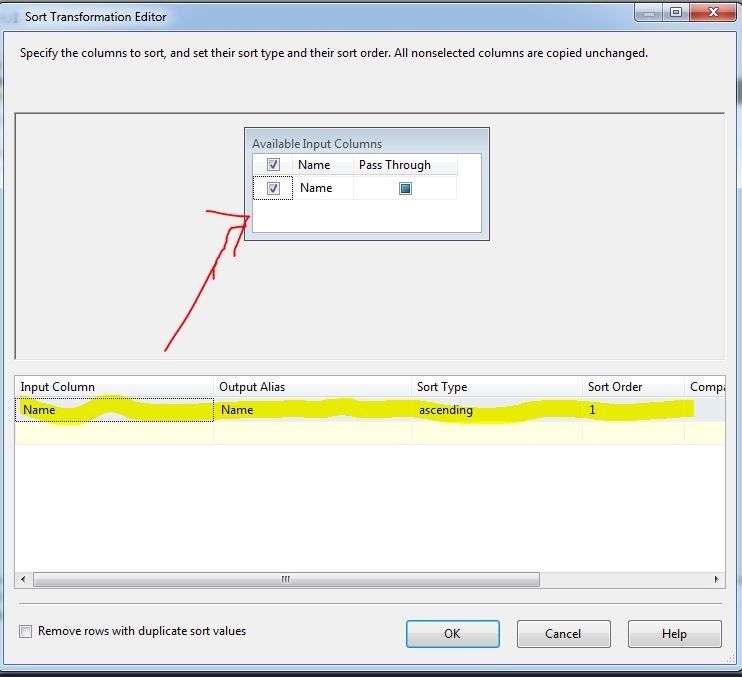 Step 12:- Now press OK you will get flat file destination editor in which you can select mapping option and just check it for your query whether all the selected columns from source are aligning or not. Step 12:- Once we done with this you will see the cross image in red disappear. If you are still seeing this it means there is something going wrong with configuration. Now if everything is good then we can run our first own created package by pressing F5 or with Start option in IDE. Step 13:- If everything is correct you will get right check in green apart from this you might be interested how many rows transfer from source to destination so that information also can be found. see below image for detail. In our case we moved 504 rows. 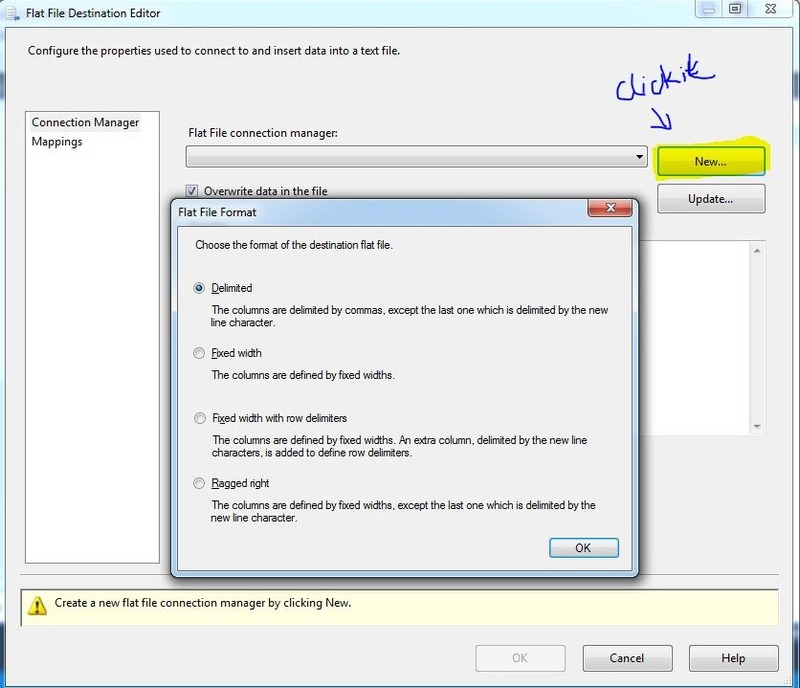 Now lets cross check at the destination location as well whether the file is created or not with these 504 rows. WOW , we did it . 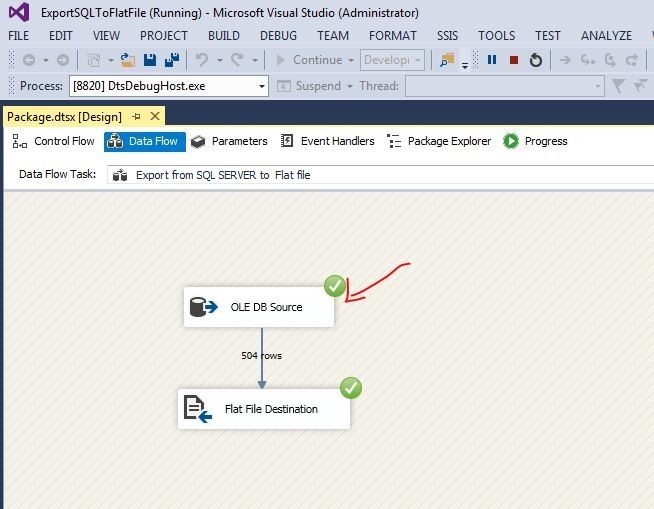 We created our first simplest package which is export data from SQL to flat file. I hope you enjoyed the learning. In next step we will do something more advance. mean while I request you all to do same practice and try to use excel instead of flat file. Please do write your inputs. Let me know whether you are enjoying this series or not. This is one of the challenge for most of the developer to write dynamic SQL. Generally we follow the approach of string concatenation. This seems very easy but we need to cast the parameters in VARCHAR and sometimes we stuck in single code. I am sure this happened with all of us. Let’s understand first a straight forward way which we (most of us) are using. In example I am using person table of Adventureworks database and it is just a simple query which provide person row according to primary key. If you see above query, you will find we are not using any type conversion the statement is clear. This is one of the best way to write dynamic query which is not only increase your statement’s readability but also increase performance of your query with certain amount. Which we will discuss in next tip. I hope now you are eager to use this and replace all your old fashion dynamic queries. Please do post your feedback. As we discussed earlier in TIP#103 for NULL in which I shared that we have to take extra care for NULL. 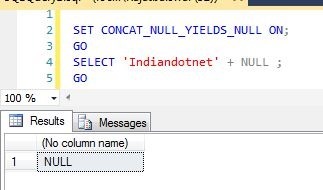 Now in this tip I would like to share one of the interesting setting for NULL. Although it is just for knowledge but don’t use it because it is deprecated in future version and by default you this setting is always on. Still you are thinking for which setting I am talking about. Now, see what happens when we do it OFF. So, We clearly saw in above image when we set the CONCATE_NULL_YIELDS_NULL property to OFF it dissolved the NULL property. My take on this property is that we should avoid it don’t try to make it OFF explicitly because if we do this then we explicitly breaking some hidden business rules. I hope all of you aware of User define table type (a table value parameter) which we discussed earlier in TIP #57. Now recently one interesting incident happened. We are using a user define table type in few stored procedure and due to some business requirement change we need to change /update data type of a particular column from TINYINT to SMALLINT. 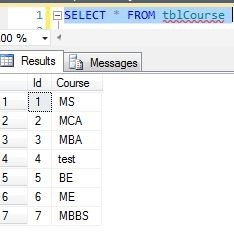 Now this change was seems very simple you just need to change a column’s data type but when you are going to do this, you will find this is not pretty straight forward (if the User define table type is referred in different tables). 3) Remove old User define table type. This 4 steps helped me a lot. I hope this may help you as well. I recently gone through something and found a unique way of aliasing. I thought it must be share so other techies also aware of it (or might be you already aware of it). I hope you may like this tips. Whenever we develop application of maintain application we define sets of rules or policies like naming convention , data type, database & SQL SERVER properties (like which property should be unable or disable) but the problem is to cross check or to enforce these properties is very tedious. 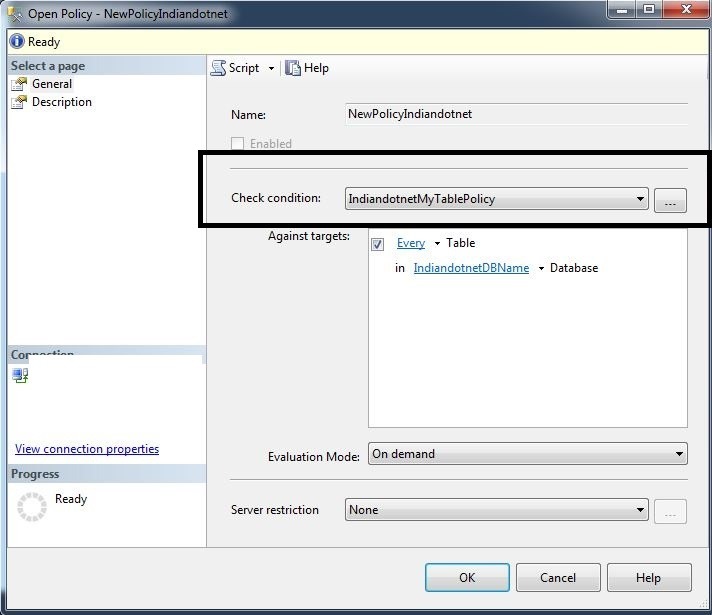 To enforce the policies SQL SERVER provided a great feature which is Policy Based Management. 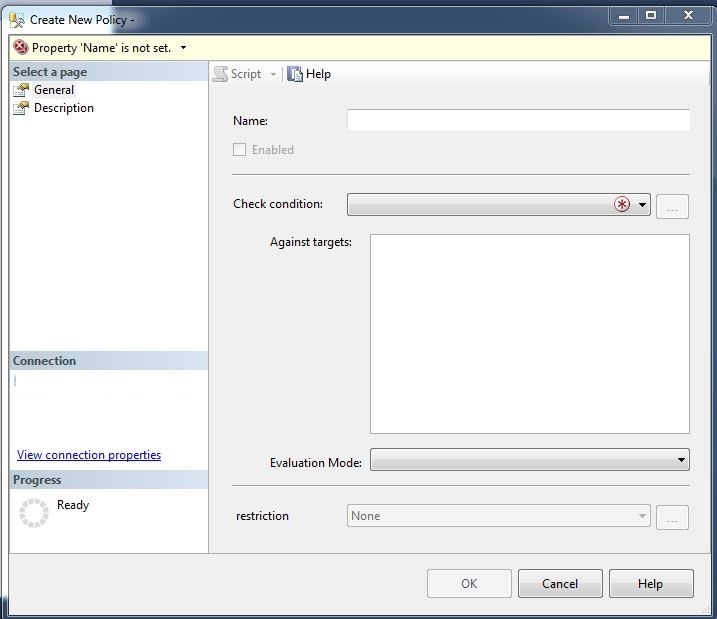 This is the feature which helps you to not only write the policies or rules but also enforce and cross check whether those rules or policies is followed in your environment or not. 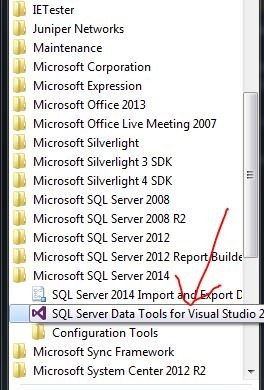 Although these feature is mainly for A DBA but I think it is good for a everyone who love SQL Server. Now let me share an example which will help us to better understand Policy Based Management. 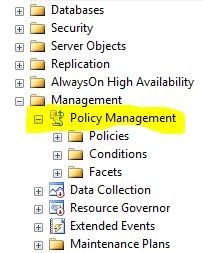 So when you expand the Policy Management in Management feature You will see 3 different folders which are facets , condition and policies. So there are around 84 in build facets which is basically properties for different conditions. Conditions are basically simple check applied using facets. Policies are created on condition which will enforce once it created. 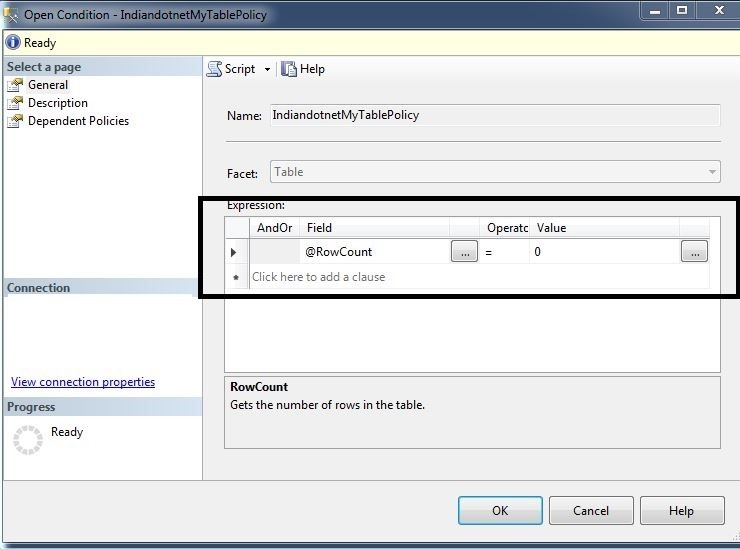 Below I am creating policy to check table who has row count =0 (Little bit odd) .You can try with stored procedure name not started with sp_ (will be good start as well). We are creating a simple condition which will check the table which has RowCount is 0. 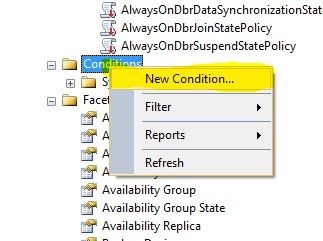 Once you created this condition you will get condition in conditions folder. Now once condition is created we have to create policy. 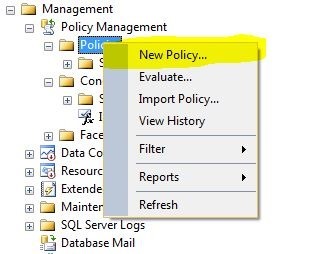 To create policy we have to right click on policy and select new policy. We can set evaluation mode according to our need. Once you saved the policy we can run it any time. So , If you see above highlighted row which means a table contain Row Count. I hope with above steps you understand a basic way to create Policy Base Management concept. 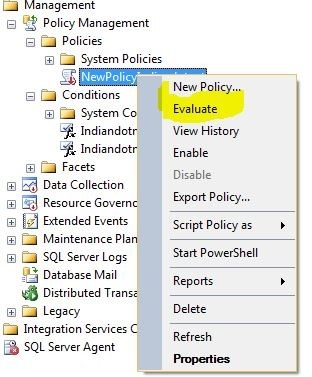 Policy based management is surely a great tool to manage database. Please feel free to give a chance whether you are DBA or not. When, I first saw this statement a Hindi proverb come to my mind which is “1 teer 2 nishane” . The meaning of this proverb means a single bow which hit two different aim in one shot. So let me explain “Merge” statement in more detail. 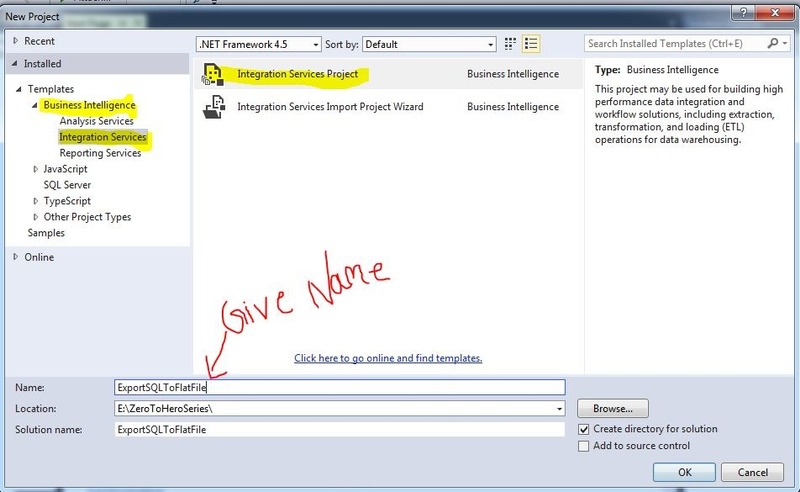 With the help of this Merge statement we can do insert ,update and delete with a single statement. Let’s write Merge Statement for all the 3 above work. Now you observed that there is one more statements which is written explicitly apart from the condition which is OUTPUT clause which helps us to determine what operation is performed. Now see the actual data in both the table. So, a simple merge statement is doing all 3 operations like update, insert ,delete. I hope this tip will help you some where. Recently, When we were delivering session on “SQL SERVER” one of the persons asked why we require Aliasing so I thought this might be question in everyone’s mind. So lets start with couple of well know statements then we will see the actual problem where we need it explicitly. There are two type of aliasing we can do a column aliasing & table aliasing. Aliasing might help you in readability of stored procedure or function. It helps when you retrieving any calculated or derived column which need in your application so lets starts with some example. Now ,lets talk about the table aliasing. So table aliasing help you in readability and it is helpful when you require self join or same table is required in join. The aliasing will be helpful when same table join is required multiple times. I hope this tip might helpful to someone. I would appreciate if you provide you inputs as well where we can utilize aliasing. We always take NULL very lightly. Like if we are designing database then whether it is necessary or not we allow the data field to accept null.We think it will not affect anything. Actually , at some point this is not always true. According to Microsoft NULL is an Unknown value. It is not EMPTY & ZERO. It is just unknown. Now according to my experience NULL is very sensitive and should be handle with care. While we are designing the database and in a particular table if a field can not be null according to business rule then please don’t allow NULL in that field for data consistency. For example if we have a StudentEnrollment table and in the StudentEnrollment table we have reference of StudentId which is primary key of StudentId and that can not be NULL then please don’t make the field null able. So , be always careful when your column has null values. I hope the above points might help you somewhere. Keep learning & Keep Sharing ! !